UPDATE: Another Austin Foodie was kind enough to post his own thoughts on Hopdoddy’s and, as one burger lover to another, it is best and fair to also take his feelings toward Hopdoddy’s into account! A few days ago Chip and I tried Hopdoddy’s during a hankering for a burger. Normally, we’d go to Phil’s Ice House or, if we were in a rush, P. Terry’s, but in the spirit of trying new things, we found ourselves at the newer Austin chain. Yes, I did call it Hop Daddy’s for the longest time. Thanks for asking. Background on Hopdoddy’s: Two guys, Larry Foles and Guy Villavaso, created this chain, one man based in Austin and one in Scottsdale, AZ. Now, about these two boys: They’re the brains behind Z-Tejas, Roaring Fork, Eddie V’s, and The Salty Sow, a new favorite, and all restaurants I’ve enjoyed in my life here in Austin. In November of 2011, however, these men decided to sell the rights to a couple of their eateries to the same corporation that owns Red Lobster and Olive Garden. A sale to the tune of $59 million. You read that correctly. And they, like anyone that just gets an absurd amount of money that generations of their kin can live off of, decided to create more restaurants. Because the restaurant business is known for being relaxing. Yeah, it’s crazy, but that’s what they did. Hopdoddy’s was their newest venture. It offers a varieties of meat as well as a veggie option. All of their beef is hormone and antibiotic free and humanely processed. They also offer Bison, Turkey, Lamb, and Sushi-grade Tuna, and their buns are freshly baked twice a day. Their menu has some very appetizing combinations, including The Buffalo Bill (Bison, Blue Cheese, Frank’s Hot Sauce, Apple-Smoked Bacon, Sassy Sauce) and the Primetime (Texas Akaushi Beef, Brie Cheese, Truffle Aioli, Arugula, Caramelized Onions, Steak Sauce). Chip ordered the Llano Pablano (Angus Beef, Pepper Jack, Roasted Poblano Chiles, Apple-Smoked Bacon, Chipotle Mayo and, no, if you say Llano properly it doesn’t rhyme) and I got the Magic Shroom (Angus Beef, Texas Goat Cheese, Field Mushrooms, Mayo & Basil Pesto) with brie instead of goat cheese. The Llano Pablano burger with fries. 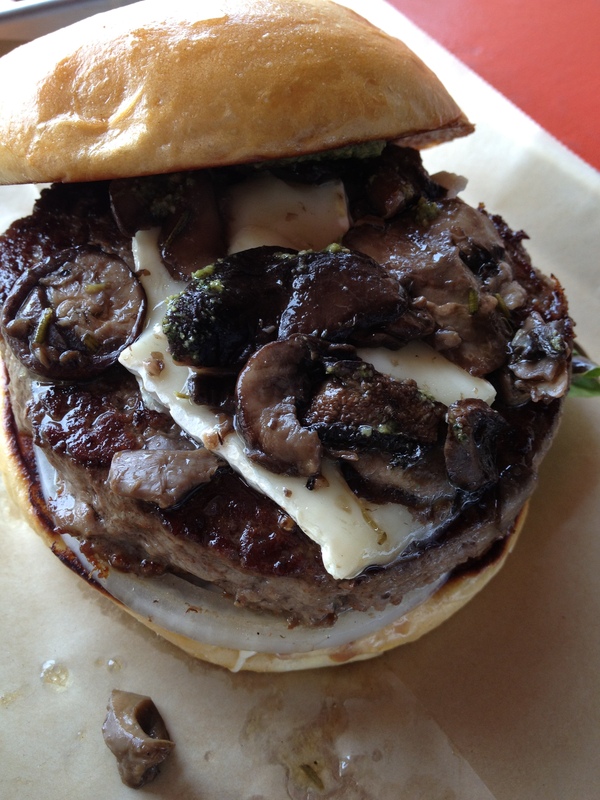 The Shroom burger with Brie instead of Goat cheese. The burgers were tasty, they really were. And for an order-at-the counter style joint, there was actually roving waitstaff to clear plates and refill drinks, as well as run orders out to tables. The fries were some of my favorite in town. The vibe is hip, the food good, and the price is to be as expected for the quality of the food you’re getting. So it’s by far a great experience all around. Is it great? Meh. I’m just partial because everyone’s favorite burger joint is personal to them. Luckily in Austin we’re spoiled by good burger bars and you only have to pick your favorite and argue endlessly over delicious versus delicious-er with friends. P. Terry’s – Great for on the run and better than any Whopper Jr. you’ll ever had. AWESOME fries and good shakes, too. My pick for a fast burger that’s just the right size, fresh and flavorful, with great fries. Hat Creek – A larger burger than P. Terry’s, but just as fresh with a few more options, but not as many locations as the hometown favorite. Lacks the awesome fries. Chip’s pick for on the go. Phil’s Ice House – Super family friendly, right next to Amy’s Ice Creams, offers great burger combinations, sweet potato fries, and onion rings, and even have foot long corn dogs. This is my pick for a Saturday lunch when Chip and I want to sit for big burger that will fill us up right up to a late dinner. 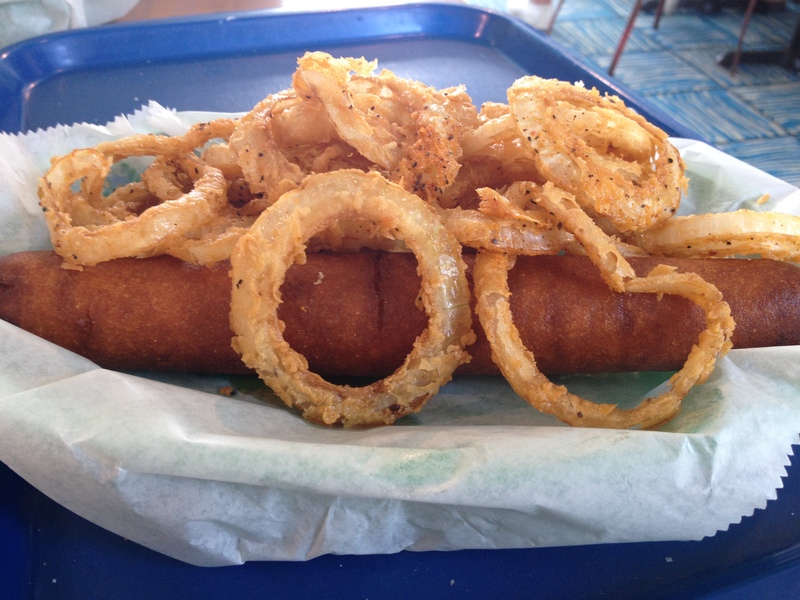 Onion Rings and Footlong Corn Dog at Phil’s Ice House. Crown & Anchor – Good burger, great lunch atmosphere, perfect for when I worked on campus and wanted an affordable and yummy burger, salad, and beer for lunch. It’s not amazing, there aren’t a ton of options, but it’s tasty and a little dive bar-esque, which is an excellent pick me up for the middle of your day. Hut’s – Endless options of combinations, decent burgers, HUGE onion rings, and their Buy-One-Get-One on Tuesdays make them a super affordable choice for families and college students. Chip, myself, and a couple of friends practically lived there on Tuesday nights when we first moved to town and were trying to make it all work. Not saying they’re tops, just saying their an inexpensive alternative with an extensive menu. Bottom line: Go to town; while out and about pick a local burger joint, because you can’t go wrong with any of the above. For more Austin Adventures and Recipes be sure to follow me @TheNerdyFoodie. This entry was posted in Comedy, Entertainment, Gastro Graze, Humor, Pop Culture, Uncategorized and tagged austin, burger, burgers, family, fast food, foodie, fresh, Hat Creek, Hopdaddys, Hopdoddy's, hut's, joint, local, p. Terry's, Phil's Ice House, review, to go. Pig & Fig – Quick, Easy, & Fancy – Paleo Friendly! 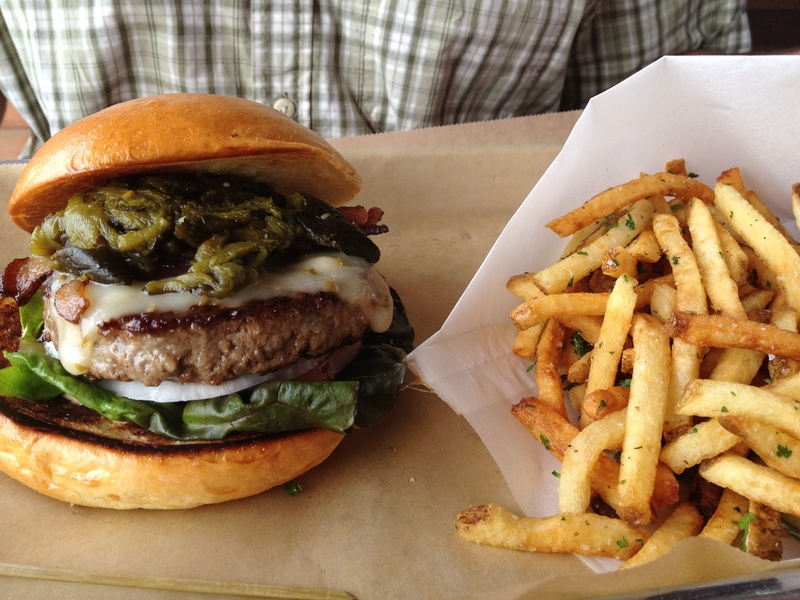 Hopdoddy’s is a top burger in Austin, bar none. (“Meh.” Sheesh.) Hut’s is consistently overrated. (Like it’s great because its supposed to be great. But it’s not, great, that is.) Right on the money with P. Terry’s & Phils. Goes to show how subjective “a great burger” can be.